In 1894, the Borough Council of Ramsgate decided to welcome new visitors to their town by changing its appearance from that of a busy fishing port to one with picturesque gardens and promenades. 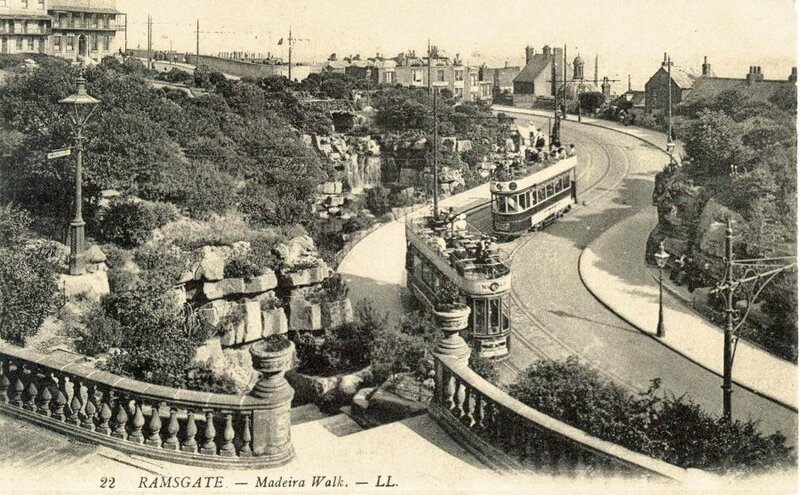 One of the first stages of their plan was to create a new road to wind up from the harbour to the East Cliff, to be called Madeira Walk. They engaged James Pulham and Son to make it look as if it had been cut through a steep gorge, with rocky ‘cliffs’ on either side, and the results were quite spectacular. They built stratified Pulhamite ‘rocks’ shoring up the steep banks of the gorge, leading up to a balustraded terrace – bordering the old Albion Road – at the top, and included an artificial cascade half way up. This was the first of three or four stages of the complete ‘makeover’ of Ramsgate – the others taking place during the 1920s, as recorded in Chapter 41 of this book. Posted on September 7, 2014 June 27, 2016 by Claude HitchingPosted in Book ContentsTagged . . James Pulham and Son, Borough of Ramsgate, cascade, Claude Hitching, Madeira Walk - Ramsgate, Pulhamite 'cliffs', Rock Landscapes: The Pulham Legacy.